The International Cricket Council (ICC) shared a hilarious picture on its official Twitter handle which took a potshot at profile pictures put up by people, and how it hides the full truth. That the Cricket governing body decided to do it through "The Gentlemen's Game" itself has amused people to no end. ICC Pokes Fun at Tim Paine’s Babysitting Comment as Rishabh Pant Poses with Aussie Captain’s Wife & Babies. The picture shared by ICC shows two images merged. 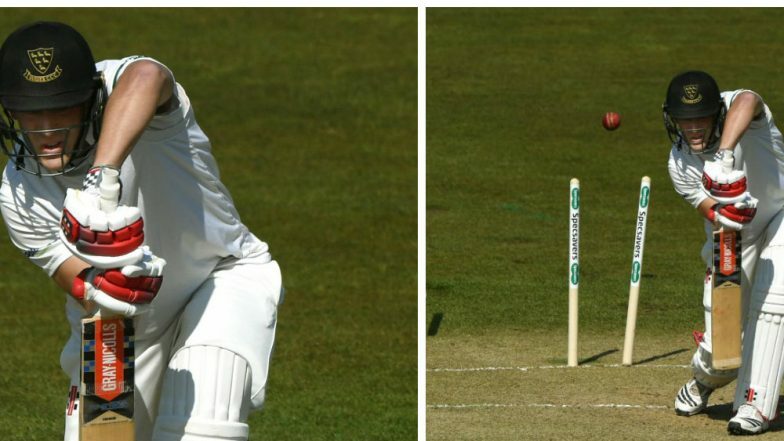 In the first half of the picture, it looks as if the batsman has played a perfect defensive shot. However, it's the second part of the picture which holds the complete truth. The other half shows that the batsman in the picture got clean bowled. Best Memes on ‘Virat Kohli Wins All ICC Awards 2019’ by Twitterati Will Make You Feel Proud and Laugh at the Same Time. As expected, Twitterati started coming out with their own version of the "Profile Picture vs the Full Picture". And one of them was directed on ICC itself. Coming back to the original picture shared by ICC, the batsman in the picture is Michael Burgess and it is from a match played between Sussex and Durham teams. Burgess was bowled by C Rushworth in the match. Little would he have known that him getting bowled would became a talking point on the social media.